Merlin: Why, they might even make a motion picture about you. Merlin: Oh. Heh-heh-heh, uh, well, uh, that's something like television... heh-heh... without commercials. Merlin: Blow me to Bermuda! [Merlin suddenly blasts off like a rocket] Arthur: Where... W-where did he go? Archimedes the Owl: To Bermuda, I suppose. Arthur: Where's that? Arthur: Will he ever come back? Merlin: So you must plan for the future, boy! You've got to find a direction! And you've, uh... oh, er... Now, by the by, what direction is this castle of yours? Arthur: I think it's north, the other way. Merlin: All right, then we better get a move on. Come on, lad. Pick up the pace. Pick it up! Pick it up! Pick it up! Arthur: Hey, we were doing fine until we got in deep water. Then along comes this huge pike with big jaws and sharp, jagged teeth. Kay: Oh, tell 'im off, dad. Arthur: He was a monster, the biggest fish I ever saw. Sir Ector: And, boy, that's the biggest fish story I ever heard! Arthur: But it's true, sir. Sir Ector: That's three demerits for being late, and three more for the fish story. Now hop it to the kitchen. Kay: [scoffs] I told you the Wart was looney. Sir Ector: Eh, well, he's either out of his head or, uh, there's something mighty fishy going on around here. Sir Ector: Oh, no. No, no, no, Kay, no. He might cast an evil spell on the lot of us. Turn us all to stone. Shh. No, there's no telling WHAT the old devil might do. Arthur: He's not an old devil! He's... he's good, and-and his magic is good, too! If... if you just leave him alone! Sir Ector: Now, look here, Wart! That's three more demerits! Arthur: Just because you can't understand something, it... it doesn't mean it's wrong! Sir Ector: Ten more demerits! Arthur: You make all the rules and... and nobody else can say anything! Sir Ector: You said aplenty, boy! All that popping off just cooked your goose! Kay, from now on, young Hobbes is your squire. Ha! Did you hear that, Wart? Hobbes is going to be Kay's squire, hm-mmm. Kay: That'll teach you to pop off, you little pipsqueak. Archimedes: What-what-what? Wht-wht-what's up, boy? What's going on? Archimedes: Oh, it's a battle of wits. The players change themselves to different things in an attempt to, uh... to... destroy one another. Archimedes: Well just watch, boy. Just watch. You'll get the idea. Archimedes: ...you do as I say. Archimedes the Owl: All right. Now, to start off, I want you to read these books. Archimedes: That, my boy, is a mountain of knowledge. Arthur: But I... but I can't read! Archimedes the Owl: What-what? What? Then I don't suppose you know how to write? Archimedes: Well, what DO you know? Archimedes: Well, never mind, never mind. We'll start at the bottom - the ABCs. Kay: [Wart is following Kay while he is hunting. Kay turns to him] Quiet, Waaaaart! Arthur: [from a tree branch over Kay's head] I'm tryin' to be. Sir Ector: There you are, you old goat! Well, what's the idea of flinging your evil spells all over the place, hm? Ugh, lend me a hand, boy. Sir Ector: Well, what have you got to say for yourself, hm ? Merlin: You call washing dishes and sweeping floors a work of evil? [Merlin turns Arthur back into a human and Arthur laughs, which causes the girl squirrel to gasp] Arthur: There, now you see? I'm not a squirrel. I'm a boy. [the girl squirrel chirps as if asking a question] Arthur: I tried to tell you. I'm, I'm a boy. A human boy! [the girl squirrel climbs up to a knot on her tree and sniffs] Arthur: Oh! If you could only understand. [the girl squirrel runs up to the hole in the tree and cries her heart out as Arthur remorsefully walks away] Merlin: Ah, you know, lad, that love business is a powerful thing. [the girl squirrel, sobbing, watches Arthur slowly walk away] Arthur: Greater than gravity? Merlin: Well, yes, boy. In its way, I'd, uh... Yes, I'd say it's the greatest force on earth. Arthur: Ooo, let go, let go! Arthur: Oh you big bug-eyed bully you! Arthur: [enters Merlin's room wearing his squire robes] Merlin, look! I'm a squire! Merlin: [disapprovingly] Ha! Archimedes the Owl: Oh... uh... very nice, boy. Merlin: Yes, indeed. A fine monkey suit for polishing boots. Arthur: It's... it's what all squires wear. Merlin: And I thought you were going to amount to something. I thought you had a few brains! Great future! Ha! A stooge for that big lunk Kay. Congratulations, boy! Sir Ector: Here's to Sir Kay and - who knows? - the future king of al England! Kay: Watch it, will ya? Sir Pelinore: [suddenly considering this] Kay the King? What a dreadful thought. Sir Ector: [thundering the words] GADZUKES! BLACK MAGIC OF THE WORST KIND! Arthur: You were really great, Merlin, but... but you could've been killed. Merlin: It was worth it, lad, if you learned something from it. Arthur: Knowledge and wisdom is the real power. Merlin: Right you are, Wart, so stick to your schooling, boy. Arthur: Oh, oh, don't worry. I will, sir. I will. Oh, I really will. Merlin: By George! I've had enough of this nonsense! ALAKAZAM! [In an atom bomb explosion, Merlin changes back into a human, causing the female squirrel to scream.] There! You see? I'm an ugly, horrible, grouchy old man! [Merlin turns Arthur back into a human and Arthur laughs, which causes the girl squirrel to gasp.] Arthur: There, now you see? I'm not a squirrel, I'm a boy. [The girl squirrel chirps as if asking a question.] I tried to tell you. I'm-I'm a boy. A human boy! [The girl squirrel climbs up to a knot on her tree and sniffs.] Oh! If you could only understand. [The girl squirrel, sobbing, pokes her head out of her tree hole and watches Arthur and Merlin slowly walk away.] Arthur: Greater than gravity? Merlin: I'm sorry, lad. Sorry I spoiled everything. I know that trip to London meant a great deal to you. Arthur: Oh, it's not your fault. I shouldn't have popped off. Now I'm really done for. Merlin: Use your head, and education, lad. Arthur: [lightning up] What good would that do? Arhtur: [resigned] Well, what have I got to lose? Merlin: That's the spirit! We'll start tomorrow! We'll show 'em, won't we, boy? Arthur: [pointing to the airplane model] What's that thing up there? Merlin: Hmm? Oh, yes, of course. Here we are. Archimedes: [scoffs] If man were meant to fly, he'd been born with wings. Merlin: It would have worked if... if it weren't for this infernal beard! [Archimedes continues to laugh harder.] Man will fly someday, I tell you! I have been there. I have seen it. Narrator: So, at last, the miracle had come to pass in that far off time, upon New Year's Day. And the glorious reign of King Arthur was begun. Madame Mim: Thank you, my boy. But that's nothing, nothing to me. Because I'm the magnificent, marvelous, mad Madame Mim! Merlin: Well! So, you did drop in for tea after all! Oh, you are a bit late, you know? Arthur: [entering the forest] I-I'll get the arrow, Kay. I'm sure I can find it. Kay: Huh! Oh, don't tell me you're going in THERE. Why, it's swarming with wolves. Kay: Huh. Well, go ahead. It's your skin, not mine. Go on, go on. Sir Ector: [on Archimedes] Say, say, I know! You've got him under a spell, Marvin. You're a magician, hm? Merlin: The name is MER-LIN and I happen to be the world's most powerful wizard! Sir Ector: [laughing] Come off it, man! Ha! Hoo-hoo! Gadzooks, ha-ha-ha...! Merlin: All right, I shall demonstrate. Merlin: Higitus, figitus, migitus moe, wind and snow, swirl and blow! Madame Mim: Now what do you think, boy? Who's the greatest? Ha-ha-ha HA ha-ha! Arthur: Well, uh, Merlin's magic is always... uh, well... useful, uh... for something good. Madame Mim: And he must see something good in you. Arthur: Oh, I suppose so. Madame Mim: Yes, and in my book that's bad! Madame Mim: So, my boy, I'm afraid I'll have to destroy you. Madame Mim: Yeah, I-I'll give you a sporting chance. I'm mad about games, you know. Madame Mim: Well, come on, boy, get going. You gotta keep on your toes in this game. Sir Pelinore: Pelinore! It's Pelinore, dash it all! I've got big news from London! BIG NEWS! Come on, man, drop the bridge! Archimedes the Owl: [irritably] Not interested. Merlin: Oh, come, come, come, come, now. You're as wet as you can get! Archimedes the Owl: No! Nope, nope, nope! Merlin: Archimedes! I'll turn you into a human. Archimedes the Owl: Hm! You wouldn't dare! Archimedes the Owl: All right, all right, all RIGHT! [Flies off to spy on Sir Ector and Pelinore] Merlin: All right, eh? He-he-he! Works every time, heh! Just like magic. Merlin: [Struggling with a well] A dark age, indeed! Age of inconvenience! No plumbing, no electricity, no nothing! Merlin: Oh, hang it all! Hang it all! Merlin: Oh, now what, now what? Here, leave off! Leave off! You... you fiendish chain, you! Everything complicated! One big medieval mess! Merlin: Higitus Figitus Migitus Mum! Prestigitonium! Higitus Figitus Migitus Mum! Prestigitoni-UM! Merlin: Don't... don't you get any foolish ideas that magic will solve all your problems, because it won't. Arthur: But sir, I don't have any problems. Merlin: Oh, bah! Everybody's got problems. The world is full of problems. Merlin: D'oof! Oh, blast it all! There, now! You see what I mean? Sir Pelinore: It's not a mere matter of muscle, son. Uh, jousting is, uh... a fine skill. It-it's a highly-developed science. Merlin: Oh-ho-ho-ho. Science indeed. One dummy trying to knock off another dummy with a bit of a stick. Archimedes the Owl: And the Wart's just as hot for it as the rest of them. Merlin: Aye, that he is. That boy has got real spark. Lots of spirit. Throws himself heart and soul into everything he does. That's really worth something, if it could only be turned in the right direction. Archimedes: Ha ha! Fat chance of that. Merlin: Oh, I plan to cheat, of course. Use magic. Every last trick in the trade if I have to. Sir Ector: I, uh, I hope you don't go in for any of that black magic. Merlin: Oh, no, no, no, no. Never touch the stuff. Merlin: [about Archimedes] When he stays out all night, he's always grumpy the next morning. Arthur: Then he must stay out every night. Arthur: Merlin! Merlin, I-I swallowed a bug! Merlin: Oh, well, what's wrong with that? After all, my boy, you ARE a fish. Instinct, you know. Arthur: But you said I have no instinct. Merlin: Yes! Oh... oh, I did? Well that's-that's neither here nor there. Merlin: Madam, I have not disappeared. I'm very tiny. I am a germ. A rare disease. I am called malignalitaloptereosis... and you caught me, Mim! Archimedes: Now, boy, flying is not merely some crude, mechanical process. It is a delicate art. Purely aesthetic. Poetry of motion. And the best way to learn it is to do it. Merlin: I have come to educate the Wart. Sir Ector: Oh, no, you don't. I'm running this place, and if you think you're gonna fiddle with my schedule, you'd better pack up your bag of tricks and be gone! [Merlin promptly disappears] Sir Ector: What? Well, by Jove! Hey, he's gone. Merlin: [disembodied voice] I'm gone, but then, I'm not gone. Heh-heh-heh. So if I do leave, you can never be sure that I am gone, can you? Sir Ector: Well, uh... heh-heh-heh-heh... Well, I must say, you... got me there, Marvin. Uh, heh. Yes, well, you win. You're welcome to stay if you like. Merlin: [appearing suddenly] Thank you. You're very kind. Very generous, I must say. Archimedes: Oh, Man will fly all right - ho-ho-ho! - just like a rock. Madame Mim: Sounds like someone's sick. How lovely. I do hope it's serious. Something dreadful. Merlin: Hockety pockety wockety wack! Odds and ends and bric-a-brac! Merlin: [to Wart] Be with you in just a minute, son. Packing's almost done. Ha! Archimedes: [to Merlin] You, you, you - bumbling blockhead! Merlin: [to the sugar pot] Impudent piece of crockery. Madame Mim: Now, first of all, if you don't mind, I'll make the rules. Archimedes: Rules indeed! G'ha-ha-ha! Why, she only wants rules so she can break 'em. Madame Mim: I'll take care of you later, feather-brain. [Archimedes huffs indignantly] Madame Mim: Now, Rule One: No mineral or vegetable, only animals. Rule Two: No make-believe things like, uh, oh, pink dragons and stuff. Now, Rule Three: No disappearing. Merlin: Rule Four: No cheating. Merlin: Now, now, Mim, Mim, no... no dragons, remember? Madame Mim: Did I say no purple dragons? Did I? Merlin: Oh, it's not too serious, madam. You should recover in a few weeks and be as good, uh... he-he-he, I mean, as BAD as ever; but, uh, I would suggest plenty of rest, and lots and lots of sunshine. Madame Mim: I hate sunshine! I hate horrible, wholesome sunshine! I hate it! I hate it! I hate, hate, hate, HAAATE...! Merlin: Now, Archimedes. Why would you half-drown yourself for a tidbit of fish, eh?, and after such a big breakfast? Merlin: There! You see? I'm an ugly, horrible, grouchy old man! Merlin: Don't take gravity too lightly or it'll catch up with you. Merlin: Gravity is what causes you to fall. Arthur: Oh, like a stumble or... or a trip? Merlin: Yes, it's like a stumble or a... No, no, no, no, no. It's the force that pulls you downward, the... the phenomenon that any two material particles or bodies, if free to move, will be accelerated toward each other. Archimedes: If the boy goes about saying the world is round, they'll take him for a lunatic. Arthur: The world is round? Merlin: Yes. Yes, that's right, and it also, uh, goes A-round. Arthur: You mean it'll be round SOMEDAY. Merlin: No, no, no, it's round now. Man will discover this in centuries to come. And he will also find that the world is merely a tiny speck in the universe. Archimedes: Ah! You're only confusing the boy. Before you're through, he'll be so mixed up, he'll... he'll be wearing his shoes on his head! Arthur: But I'm supposed to do it. Merlin: No one will know the difference, son. Who cares as long as the work gets done? Arthur: You mean you can see everything before it happens? Merlin: ...I figured the exact place! Arthur: I'm in an awful pickle. I'm king! 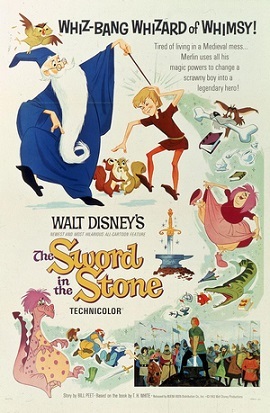 Archimedes: Ooo, he pulled a sword from the stone. Merlin: Ha ha! Of course, of course. King Arthur and his Knights of the Round Table. Merlin: Oh, uh, w-would you rather have a square one? Arthur: Oh, no. Round will be fine. Merlin: [teaching Arthur to swim as a fish] Now, there are lots of ups and downs like, like a... like a helicopter. Merlin: Yes, y... oh. Well, no, never mind. Merlin: [covering Sir Ector with magical indoor snow] That is what I call a "wizard blizzard". Sir Ector: [shivering] Hey, Kay. Hey, would you look at this? An indoor blizzard! And in the month of July! Narrator: And below the hilt, in letters of gold, were written these words: "Whoso pulleth out this sword of this stone and anvil is rightwise king, born of England." Though many tried for the sword with all their strength, none could move the sword nor stir it; so, the miracle had not worked, and England was still without a king. And in time, the marvelous sword was forgotten. This was a Dark Age, without law and without order. Men lived in fear of one another, for the strong preyed upon the weak. Minstrel: A legend is sung, of when England was young, and knights were brave and bold. The good king had died, and no one could decide who was rightful heir to the throne. It seemed that the land would be torn by war, or saved by a miracle alone. And that miracle appeared in London town: The Sword in the Stone. Merlin: Bermuda? Yes, back from Bermuda and the 20th century, heh-heh. And, believe me, you can have it. One big modern mess! Madame Mim: Say, lad, did you know that I can make myself uglier yet? Madame Mim: Oh, ho! You see? I win, I win! Aren't I hideous, boy? Perfectly revolting? Arthur: [shaking his head at first, then nodding] Uh... yes, ma'am. Arthur: Oh, what a perfect stuffed owl. Archimedes: [huffing] Stuffed... W-w-well, I... I beg your pardon! Arthur: He's alive, and he talks! Archimedes: Heh-heh-heh! And certainly a great deal better than you do! Merlin: Archimedes, where... where-where are we? Archimedes: In a tumbled-down old tower in the most miserable old castle in all Christendom. That's where. Archimedes the Owl: Don't you even remember the boy? Merlin: Uh... The boy? Sir Ector: [outside, to Kay] Can't you remember one blasted thing? Sir Ector: Firm grasp on the lance! Merlin: [realizing it's not from Archimedes] Oh.